Council members voted unanimously to maintain the sanctions until at least 15 February next year after receiving the final report from the Group of Experts - who have also been re-established as a result of today's resolution - on the monitoring of illegal arms flows. The 15-member Council said it was most concerned about the situation in the far east of the DRC, especially the provinces of North and South Kivu and the Ituri district, where militia groups remain active and help to "perpetuate a climate of insecurity in the whole region." The United Nations peacekeeping mission in the DRC (MONUC) has also been asked to focus its monitoring activities on the Kivus and Ituri, which share a border with Uganda, Rwanda and Burundi. The embargo was first imposed in 2003 amid concerns that the growth and trafficking of arms was serving to fuel and exacerbate conflicts across Africa's Great Lakes region. 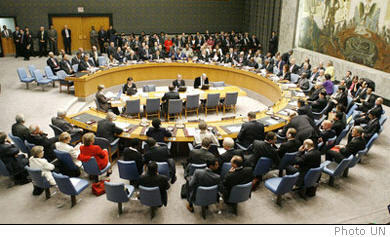 The Council also noted the link between the illegal exploitation and trade of natural resources in the DRC and the proliferation of arms. The latest report from the Group of Experts confirmed "that the most profitable financing source for armed groups remains the exploitation, trade and transportation of natural resources." It also called on the Congolese Government to ensure it is doing all it can - or seeking help from the international community when it cannot - to tackle the problem. "The Government is now in a strategic position to choose between addressing the country's ills in an effective manner or allowing violence, corruption and the absence of rule of law to continue to hinder the country and the development of its population," the report stated. The embargo does not apply to arms and related materiel intended for the use of units of the national army or police, as long as those units meet certain criteria. Any group or person who violates the embargo is subject to a travel ban and an assets freeze.